Digital and design agency Drumbeat Creative has unveiled its new site for MediaCityUK. The responsive site is intended to promote the waterside destination - now a huge creative and media hub with tenants including the BBC, ITV and dock10 - and also advertise available commercial and residential space. Andy Heggs, creative director of Drumbeat, says: "From a technical point of view, we wanted the site to be functional and fluid, but less corporate in its tone. 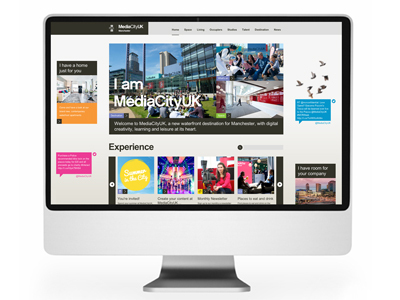 "From a branding perspective we really wanted to loosen the MediaCityUK brand. We have watched the place evolve over the last five years and have seen it really bloom recently. "With thousands of people now living, working and playing there, we have lots of stories to tell, lots of events to announce and a true sense of personality emerging for the MediaCityUK brand itself, which we have hopefully managed to capture in the creative approach." Paul Newman, director of communications at The Peel Group, added: "As well as placing an emphasis on character and colour, we wanted to showcase the businesses, both large and small, now operating at MediaCityUK. "We also have a diverse portfolio of commercial space here, so needed to ensure that site users could access detailed information for all available properties with clarity and ease. Drumbeat has already produced a range of marketing collateral for MediaCityUK, including brand guidelines, brochures and billboards. Also on its client list are The Pie Factory, The Co-operative and the Grand Arcade Shopping Centre in Wigan.